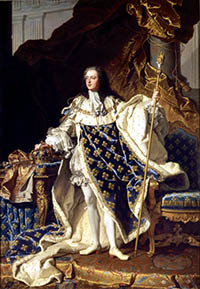 As Louis XV was not old enough to become king when his great-grandfather died, a régent ruled France in the interim. This transitional phase between Louis XIV and Louis XV style is named accordingly. Through Régence style is outside the scope of this lesson, it's important to note how this style holds elements of both Louis XIV and Louis XV style. By 1730, France was the most powerful kingdom in Europe. As France grew accustomed to its wealth, a fantasy style was produced in keeping with its achievements, aspirations, and prestige. Furniture design emphasized and aggrandized the interior decoration of paneled walls that were integrated into the large architectural setting. Flowers were the favorite motif usde in decoration of marquetry, in carvings and on wall panels. Overall, bright colors were used, a change from the more somber colors of the Louis XIV. Cabriole legs are share from Louis XIV style, but other constrained elements of Louis XIV were discarded, like stretchers and symmetry of lines. Curves were more accentuated, and design elements were no longer held in by the design borders of the piece. An important furniture maker of the time, Charles Cressent, trained as a cabinetmaker and sculptor, was ideally qualified to create the soaring grandeur of the Louis XV period. He used the commode as a sensual style to draw design away from the conservative elements of the Louis XIV style. Louis XV pieces grew smaller and less formal. Makers of Louis XV pieces discovered marketing to women, and pieces created for their size, work, and lifestyle became very popular. Singerie (motif of a gathering of monkeys), Chinoiserie (scenes that imitated Chinese art), Rocaille (motif of a shell or irregular pattern of a rock garden) were all natural elements that were incorporated. These motifs signaled a natural and relaxed impression of the world, but were also depicting these ideas in more elaborate and expensive materials. Pictorial decoration characterized by extravagantly swirling scrolls and whorls, casually strewn shell, flower motifs, and asymmetrical composition were significant elements of design. The rejection of the classical world and the asymmetry of growing flowers reflected an upper-class culture that felt completely in control, and perhaps represented concentrated wealth in the hands of few as the world had never seen. The ruling class in France at this time was confident of its rule over the church, the French people, a growing world empire, and even nature itself. It was this unfettered exuberance that made this furniture the most elaborate of the Louis styles. However, this style helped create social unrest among French people, laying the way for more conservative design style developed during Louis XVI. This CEU was created with the help and expertise of Dan Garfink, co-owner of French Accents Fine Continental Antiques in Baltimore MD. It was published in the July/August 2006 edition of Fine Furnishings International Magazine and is presented here with the permission of the publisher.